Like many of the best ideas, air source heat pump technology is simple at its heart. During the day the sun's rays heat up the air. Heat pump technology simply extracts this free energy. Even at ambient temperatures below -10°C there is enough heat in the atmosphere for an air to air heat pump to heat your home. The only additional energy the system requires is the power to drive the heat pump compressor. In fact, if the heat pump is connected to a clean energy source, such as solar power (ask for further details), running costs and CO2 emissions can be reduced even further. Air to Air source heat pumps are an excellent replacement for existing electric heating systems such as storage heaters, panel heaters or when existing radiator pipe work isn’t available. There also great at adding an efficient heating source to individual rooms such as a conservatory. 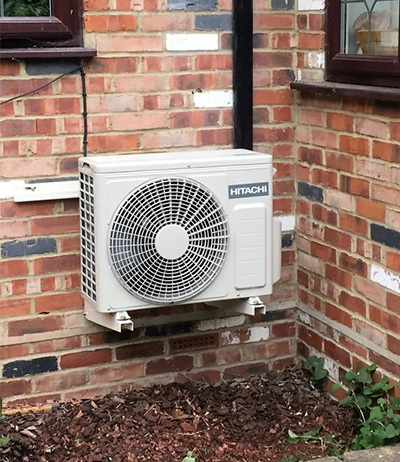 Air-source heat pumps work by extracting heat from outside and transferring it either to the hot water or heating systems of the house, or both. A well-designed system should release up to four times as much energy as it consumes. Air-source heat pumps can operate at a wide range of temperatures. Not just on a hot summer's day. The air source unit is usually located outside with flow and return pipes running from the heat pump into the house. Heat pumps can be installed in all new build properties. They can also be 'retrofitted' in existing buildings, as long as the building is sufficiently well insulated. Friendly, efficient, tidy and knew what they were doing. Excellent in all aspects. Very pleasant people to deal with, tidy and efficient. Honest, reliable company. All work completed quickly and efficiently. 4 Seasons Air Conditioning Ltd t/a 4 Seasons Solutions is an Appointed Representative of Improveasy Ltd., a company registered in England and Wales (Co. Reg. number 7807352). Registered Office: Manchester Business Park, 3000 Aviator Way, Manchester M22 5TG. The firm is authorised and regulated by the Financial Conduct Authority (FRN 708623). The firm is authorised as a Broker, not a Lender, and offers credit facilities from a panel/one lender. The credit is subject to application and status - Complaints Procedure.